Obama Gets High Marks For Diversifying The Bench The White House has taken some heat for its slow pace in nominating federal judges. But the administration has quietly pursued candidates who are far more diverse in terms of race, gender and sexual orientation than any of its predecessors, a move praised by many. But that strategy may have a cost. 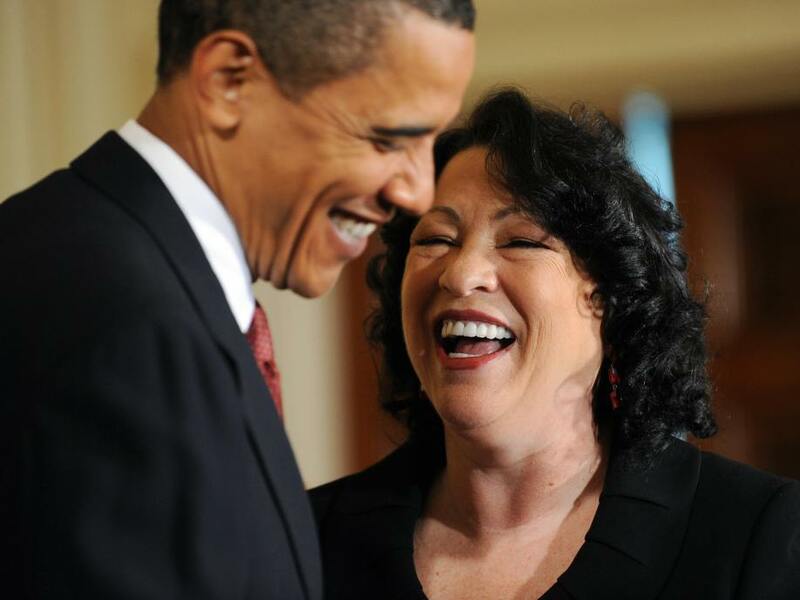 Justice Sonia Sotomayor, shown with President Obama in this file photo, became the first Hispanic Supreme Court justice during the Obama administration, one of a number of judicial diversity milestones the White House has made. "It's a very important priority for the president," Kathryn Ruemmler, the new White House counsel, tells NPR. "Having racial diversity, gender diversity, experiential diversity — all of those things we are mindful of and committed to seeking out when we're looking for the best candidates." There are almost 900 federal judges in the U.S., and most of them are still white men. Obama said during the campaign that he wanted to change that, to make sure that judges look more like the rest of the American people. And Robert Raben, a Democratic lobbyist, says he gives this White House high marks on that score. "Promises made, promises kept," Raben says. "President Obama and his team committed to improving the diversity on the federal bench, and they get an A-plus on that." Having racial diversity, gender diversity, experiential diversity — all of those things we are mindful of and committed to seeking out when we're looking for the best candidates. That sentiment is far from universal. "The Obama administration doesn't have a coherent judicial philosophy so it's not surprising that it's falling back on diversity, which I think it sees among other things as appealing to its various political constituencies," says Ed Whelan, a prominent conservative who used to work in the George W. Bush Justice Department. Whelan says it's too soon to evaluate the record of the judges Obama has appointed to the federal bench. But he says there's a simple explanation for the more diverse choices this president has made: There's a much bigger pool of minority candidates with lots of legal experience, even more so than in the Clinton administration, when diversifying the ranks of federal judges was a priority. The White House says almost half of the 97 candidates who have won confirmation during Obama's presidency are women; about a quarter are black. And Obama has nominated four openly gay people, more than any other president. He's also doubled the number of Asian-American judges on the bench. Obama continued that pattern earlier this week when he nominated Adalberto Jose Jordan to serve on the U.S. Court of Appeals for the 11th Circuit and Miranda Du, an Asian American who lived in a refugee camp in Malaysia for almost a year as a child before coming to the U.S., for the district court in Nevada. But that strategy may have a cost, says Caroline Fredrickson, who leads the American Constitution Society and has been following the judge nominees closely. "Obama is nominating many more diverse nominees than his predecessors ... strikingly so," Fredrickson says. "But the nominees are not getting confirmed with the same kind of success." Some of the longest waiting nominees, Louis Butler of Wisconsin, Charles Bernard Day of Maryland and Edward Dumont of Washington happen to be black or openly gay. The Obama administration doesn't have a coherent judicial philosophy so it's not surprising that it's falling back on diversity, which I think it sees among other things as appealing to its various political constituencies. "For women and minorities, it's just been a bigger hill to climb before they actually get a vote," Fredrickson says. "And so for whatever the reasons, the facts speak for themselves." Whelan says there are plenty of other explanations for the trouble with getting judges confirmed. "It's not at all clear to me whether the focus on diversity has delayed the process or whether other things have," Whelan says. For one thing, Whelan says the White House was slow to nominate candidates for the first year of Obama's term, and that could come back to haunt them as election season looms. Ruemmler, the new White House counsel, says she's met with senators on both sides of the aisle to try to pave the way. "We want to really hit the ground running when the Senate comes back in September to get as many folks both nominated and confirmed as we possibly can in that window of time," she says. Because if history is any guide, the window could slam shut before winter and be hard to pry open before the next inauguration.